Based on analysis of satellite images, GeoNet reported that a submarine eruption at an Unnamed volcano (GVP volcano number 243030) about 46 km NW of Tonga’s capital Nuku’alofa began on 23 January. Activity was also identified in images from 26, 28, 29, and 31 January, characterized by discolored water, and a volcanic plume on 31 January. 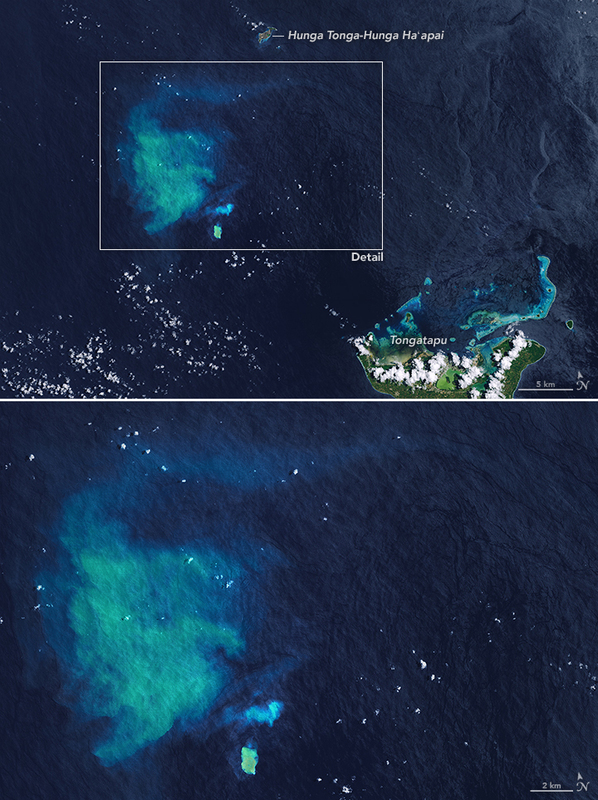 Murray Ford, a coastal geomorphologist from New Zealand's Auckland University, reported in a Radio New Zealand story on 1 February 2017 that satellite imagery showed a large plume of discolored water between Tongatapu and the volcanic Hunga Tonga-Hunga Ha'apai islands. The activity seen by Murray was on a Landsat 8 OLI (Operational Land Imager) satellite image acquired on 27 January 2017 (figure 2). which showed a bright area of discolored water above the summit and a broader area of discolored water immediately NW, likely from previous events. According to volcanologist Brad Scott (GNS Science) there are additional satellite images from 23, 26, 28, and 29 January 2017, indicating that the eruption had been ongoing for over a week. His colleagues in Tonga indicated a possible associated steam plume, but cloud cover made observations uncertain. Figure 2. Landsat 8 OLI satellite image a submarine plume from an unnamed seamount in Tonga on 27 January 2017, about 33 km NW of Tongatapu island. A small bright area of discolored water is directly over the summit (bottom center), with a small plume immediately N, and a broad area of discolored water to the NW, likely from previous eruptive events. The larger plume to the NW measures 30 km long and 20 km wide. Courtesy of NASA Earth Observatory (https://earthobservatory.nasa.gov/IOTD/view.php?id=89565). A report prepared by Taylor (2000) noted that there had been four previous reports of activity from this location: submarine activity in August 1911, a steam plume in July 1923, discolored water in 1970, and an ephemeral island near the end of an eruptive episode during 27 December 1998-14 January 1999 (also see BGVN 24:03). In a blog post about the latest eruption, Brad Scott (GNS Science) also stated that there had been discolored water and felt earthquakes sometime in 2007. Reference: Taylor, P., 2000, A volcanic hazards assessment following the January 1999 eruption of Submarine Volcano III, Tofua Volcanic Arc, Kingdom of Tonga, Australian Volcanological Investigations (AVI) Occasional Report No. 99/01, 5 August 2000, 7 p.
Information Contacts: NASA Earth Observatory, EOS Project Science Office, NASA Goddard Space Flight Center, Goddard, Maryland, USA (URL: http://earthobservatory.nasa.gov/); Brad Scott, New Zealand GeoNet Project, a collaboration between the Earthquake Commission and GNS Science, Wairakei Research Centre, Private Bag 2000, Taupo 3352, New Zealand (URL: http://www.geonet.org.nz/, http://www.geonet.org.nz/news/1usjOmF4LqaI64qScMocuW); Radio New Zealand (URL: http://www.radionz.co.nz/international/pacific-news/323569/scientist-discovers-underwater-eruption-in-tonga). William Melson and Robert A. Citron, of the Smithsonian Institution, are on location in the South Pacific . . . . Citron reported the following by cable: "Captain B.N. Rankin, Fiji Airways, spotted submarine volcanic activity on 3 January in vicinity Falcon Island. Rankin estimates discoloration of water covered 500 acre area with a definite division between a patch forming the centre and that surrounding it which was lighter in color. Captain Hillwilliss, Nukualofa, Tonga, believes shoal is Falcon Island. Captain N.M. Ganley, Fiji Airways, gave position of shoal at 35 miles [56 km] SW of . . . Falcon Island." Information Contacts: Robert A. Citron, Center for Short-Lived Phenomena, Smithsonian Institution. Admiralty sailing directions (Hydrographer of the Royal Navy, 1984) reported volcanic activity at 20.85°S, 175.55°W in 1970, the site of 1911 and 1923 activity, but noted that in 1974 the volcano was dormant. This entry suggests that the Navy received a report of activity from a passing ship. Reference. Hydrographer of the Royal Navy, 1984, West approaches - off-lying danger: Pacific Islands Pilot, v. II, British Admiralty Bureau, London, UK, p. 330. Information Contacts: Hydrographer of the Royal Navy, British Admiralty Bureau, United Kingdom. This volcanic center in the Tonga Islands, 35 km NW of Tongatapu (figure 1) and S of Falcon Island, forms part of the Tofua Volcanic Arc (TVA). The following report was compiled from various sources, as well as a submission from Paul Taylor based in part on information obtained from Tongan colleagues. Figure 1. Location map of the southern part of the central region of the Tonga Platform and Tofua Volcanic Arc showing the site of the January 1999 volcanic activity in Tonga. Note the NNE-SSW trending trough-like feature that separates the volcanic arc and the Tonga Platform in this region, which may be a southerly extension of the Tofua Trough. Falcon Island is north of the January 1999 eruption site; the structure SSE of Falcon Island contains the islands of Hunga Ha'apai and Hunga Tonga, and was the site of submarine eruptions in 1912, 1937, and 1988. Bathymetric contours are at intervals of 500 m. Courtesy of Paul Taylor. The Tonga Chronicle noted that the activity was first reported to Tonga Defense Services on 8 January by Carl Riechelmann, who had seen a plume coming from the site. On 12 January 1999 the Tonga Defence Services flew a photographic mission to record the reported appearance of a new island. Shortly after departing Tongatapu's Fua'amoto Airport in a Twin Beech equipped for surveillance operations, the crew sighted billowing white plumes from the volcano. The aircraft approached cautiously at 300 m altitude, made one circuit, then descended to 150 m for closer observation. The plane circled for almost an hour while a series of still photographs, as well as a video, were taken. During this time the crew noted that the island appeared to exhibit a pattern of rising, then receding. The island was estimated to be roughly 200-300 m long and 30-40 m wide. The crew also saw lava in a small vent that appeared to be located within a 100-m cone. The island was located at 20° 51.55'S, 175° 32.47'W (20.86°S, 175.54°W). Photographs and a report of their observations were posted on the website of Tonga Cable and Wireless. Submarine activity continued on 14 January, with turbulent water present around a 40 x 300 m shoal, but no island was observed. Reports described a vent producing an ash-and-steam column and ejecting lava fragments, and floating pumice near the eruption site. A precautionary Notice to Airmen (NOTAM) was issued to aviators on 14 January by the Nadi Aviation Control Center declaring an area within 5.5 km of the eruption site a danger area. Pilots were requested to report any signs of volcanic activity. Tongan officials also issued a warning to shipping transiting the area. On 15 January a survey team, including two geologists from the Ministry of Land, Survey, and Natural Resources, inspected the island from the deck of the VOEA Savea, according to a report in the Tonga Chronicle. At that time the island had disappeared beneath the ocean surface, but the site was still emitting smoke and fumes. Because of possible danger, boats were warned to stay away. Information Contacts: Paul W. Taylor, Australian Volcanological Investigations, PO Box 291, Pymble, NSW 2073, Australia; Kelepi Mafi, Ministry of Lands, Survey, and Natural Resources, P.O. Box 5, Nuku'Alofa, Kingdom of Tonga; Tonga Cable and Wireless, Private Bag 4, Nuku'alofa, Kingdom of Tonga (URL: http://www.candw.to/); Tonga Chronicle, PO Box 197, Nuku'alofa, Kingdom of Tonga; Tom Fox, International Civil Aviation Organization, 999 University Street, Montreal, Quebec H3C 5H7, Canada; Brad Scott, Wairakei Research Centre, Institute of Geological and Nuclear Sciences (IGNS) Limited, Private Bag 2000, Wairakei, New Zealand (URL: https://www.gns.cri.nz/). 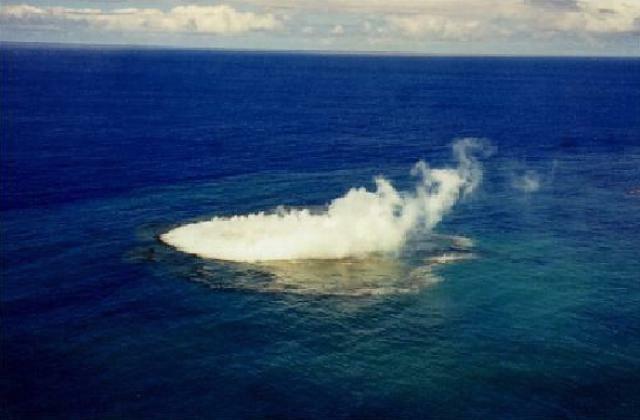 An unnamed submarine volcano is located 35 km NW of the Niu Aunofo lighthouse on Tongatapu Island. Tongatapu is a coral island at the southern end of an island chain paralleling the Tofua volcanic arc to the E. The volcano was constructed at the S end of a submarine ridge segment of the Tofua volcanic arc extending NNE to Falcon Island. The first documented eruptions took place in 1911 and 1923; an ephemeral island was formed in 1999. Richard J J, 1962. Kermadec, Tonga and Samoa. Catalog of Active Volcanoes of the World and Solfatara Fields, Rome: IAVCEI, 13: 1-38. Taylor P W, 1999. A volcanic hazards assessment following the January 1999 eruption of Submarine Volcano III Tofua volcanic arc, Kingdom of Tonga. Aust Volc Invest Occ Rpt, 99/01: 1-8. There is data available for 5 Holocene eruptive periods. Steam clouds and discolored water from a submarine eruption were observed in January 1999. This unnamed submarine volcano is located 35 km NW of the Niu Aunofo lighthouse on Tongatapu Island. The volcano, whose first documented eruptions took place in 1911 and 1923, was constructed at the southern end of a submarine ridge segment of the Tofua volcanic arc extending NNE to Falcon Island. An ephemeral island was formed during this eruption in 1999; prior to this the summit was 13 m beneath the sea surface. Photo by B. Hutchins, 1999 (published in Taylor, 1999).